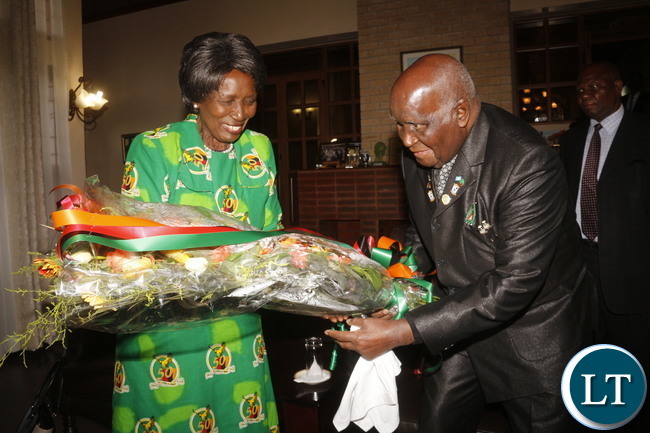 President Edgar Lungu President has sent his heartfelt birthday message to First Republican President Dr. David Kenneth Kaunda on his 93rd birthday which falls today. In his message to Dr. Kaunda, President Lungu has thanked God for sustaining the first Republican President for many years and wished him many more happy returns. The President has paid glowing tribute to Dr. Kaunda for the immense sacrifices that he and with his fellow freedom fighters made to attain Zambia’s political emancipation. The President has hailed Dr Kaunda as a living icon who should be emulated by the young generation by embracing the good values that he has always stood for, of loving God and loving fellow neighbours. President Lungu advised the nation not lose sight of the unity and love that the First Republican President has always preached under the One Zambia One Nation motto, if peace and stability is to continue. The President has said the selfless attributes of Dr Kaunda not only contributed to Zambia’s political freedom but to the emancipation of other countries in the region and beyond. The President observes that Dr. Kaunda had placed the bar high hence the country’s recognition by the international community as a beacon of peace and stability. “On behalf of the Zambian government, the people and indeed on my own behalf, we join you, Your Excellency in celebrating your 93rd birthday. We thank God for sustaining you all these years and pray for more blessings upon you. We are proud of your achievements for this country. Please accept my warm personal best wishes for good health and many more happy years,” the President said. 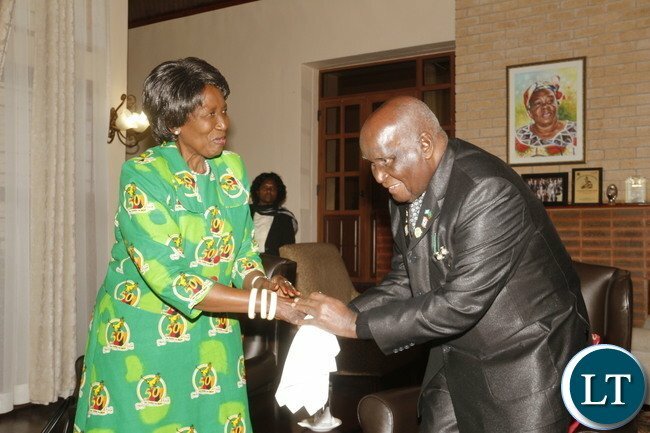 Government wishes first Republican President Dr. Kenneth Kaunda a very happy and gratifying birthday as he turns 93 years old today. As a nation we acknowledge the selfless contribution made by Dr. Kaunda and other freedom fighters to liberate Zambia from its colonial masters. Dr. Kaunda inspired millions of Zambians to fight relentlessly to bring about freedom, unity, peace and stability. We are also grateful to this exceptional compatriot for allowing himself to be used as an icon of our emancipation struggle. UNIP led by Dr. Kunda ran a spirited fight for Zambia’s independence. We also acknowledge the role which Dr. Kaunda played in the liberation of other countries in the region and beyond. Since leaving active politics in 1991, Dr. Kaunda has been playing the role of father-of-the-nation figure for Zambians. He has also been involved in various charitable organisations. His most notable contribution has been his passion in the fight against the spread of HIV and AIDS. Dr. Kaunda remains an icon not only to Zambia but Africa and the world. Government under the leadership of President Edgar Lungu is on a mission to translate the hard won political independence by Dr. Kaunda into economic independence by delivering viable services to the Zambian people and will count on the support of all as they have always done. I urge the general citizenry, particularly young people, to take advantage of this discerning and brilliant father of the nation for guidance. We love you and wish you long life and God’s blessings. Happy Birthday KK. Many happy returns. Walibomba mudala! Lungu, HH and even myself FREE EDUCATION FROM GRADE ONE TO UNIVERSITY! Both ECL and HH walked to shool but look where they are because of you KK! Long live and May the Dear Lord Bless you more! Walibomba mudala! Lungu, HH and even myself FREE EDUCATION FROM GRADE ONE TO UNIVERSITY! Both ECL and HH walked to school but look where they are because of you KK! Long live and May the Dear Lord Bless you more! If only Mushota had enjoyed the same facilities Zambia would have been a better place! Aluta continua! As the last real UNIPist alive and Founder of the President Kenneth Kaunda Fan Club on Facebook … the oldest for any African President dead or alive, I must add … I will my hero in life KK a Happy Birthday. Mr. President your legacy will outlive any other president in modern history. The real revisionist history yet to be written will eventually reveal the real gift to mankind you have been … Long Live KK, Long Live the smart people of the Zambian Enteprise!!! There’s a reason the Almighty God has kept you alive these 93 years and may He add many more to come. KK … You are the best!!!! Kaunda and Mwanwaasa were the LAST DICTATORS we had. Sata and lungu have shown how a legacy needs to be created. I wish him well and Congratulations Dr Kaunda. Don’t quiet understand why he is a Doctor without a PhD like the one I am completing in June. Meant to say “… I wish my hero” not I will. Happy Birthday, KK … Long Live Big Guy. We love you our founding father. Tiyende Pamodzi Ndi Mutima Umo!!! Tiyende Pamodzi Ndi Mutima Umo … let’s walk together in one accord and build our nation … you used to say and the proof is still there for all to see. No single president proved GDP growth anywhere in Africa during 1964 to 1980. Yes, afterwards things went south but you had the longest sustained economic growth of any president in Africa other than Dos Santos in Angola. Our dearest founding father Dr. K.D Kaunda, Happy Birthday sir! We wish you terrific health, happiness and peace of mind in retirement. You served us with distinction in Patriotism. We forever remain proud of you and our services to the country under your administration. Forever we remain sir! A happy birthday to KK and a BIG HAPPY DEATHDAY to Mushota who does nothing in HIS life apart from blogging and posting nonsensical statements. Tiyende Pamodzi. Happy Birthday KK. 1. Happy Birthday Dr K.D. Kaunda – 1st Republican President of the Republic of Zambia!!! 2. Dr President Lungu and fellow Zambians, I don’t think it’s enough for government to just send KK birthday wishes; govt should have arranged a big and memorable birthday party for KK. In fact, it deeply concerns me that as Zambians we have respect for our history. By now we should’ve erected a huge statue of KK as our liberation hero. Happy Birthday KK, my President. You deserve another 50 years more! You are truly a man of God, and that saying “KK wa mu ya ya ” was not without cause, you are really living it. God Bless you, Mr President !!!!. Mr ECL sending flowers and a letter to commemorate KK birthday is not enough, worst still just sending your VP. Give this man the respect he deserves !!! HAPPY BIRTH DAY GRANDPA KK !!! R. Mumba, your English is very bad. Happy birthday super kk, will give thanks to GOD for having you as our Father Zambia who struggles for this piace will are enjoying. Happy B my name sake. A BIG HAPPY BIRTHDAY to the father of our Nation ! We thank God for your Excellency Sir..god grant you many more years to come. KK is now on Lungu’s payroll and is now a Kumodzi Kumawa or a Wako Niwako Retired President instead of a National Father Figure. KK can see the Pain and suffering that HH is going thru inflicted by KK’s Paymaster but he chooses to turn a blind eye. Its sad to see the founding Father being compromised by Dictator Lungu in exchange for money. KK should advise Lungu to release HH without further delay and unconditionally for the Good of One Zambia. One Nation. Iwe KK can not be compromised by Lungu, he is not gaining anything from ECL`s presidency. Whatever he is getting is by law and ECL can not influence it. Your statement is quite unfair, to say the least of KK, that is just too cheap a statement. On the other hand, KK `s word on HH case could have an impact. Land of peace, work and joy. Happy birthday Super Kenneth. Your Excellency, Many Happy Returns. You are a Giant amongst us. God Bless You on this great day. For sure, God has been Faithful to you and has favoured you Mightily. You have seen all things gov’t in Zambia First and to this current day. That is a most auspicious blessing. Happy Birthday President Kaunda, Giant of our Time. We thank you for your service to us. Baba wa taifa Mr KK hongera kwa kutimiza umri wa miaka 93…i wish you well. Always thankful for you Mr. President! God be with you! What a man! What a legend! Happy Birth Day! @King, what is your problem? Immaturity is immaturity! Under Five Clinic deserves to be where he is! Born as pure SH.IT and you will DIE as pure Matu.vi! Ars.ewhore!! Chi Ny.ini kununka – kamwana ka Li Hu.le!! Free education from Grade 1 to College! What a man! He gave us all we needed! My best education which I really appreciate so much and has worked for me! Happy Birthday KK! You worked wonders for our country and we love you!! God bless you and Give you many more years of Good Health and Happiness. General kanene & Chilyata, the only trouble is that KK is from eastern, have you forgotten what hh said about easterners when he lost the election petition. Of course he was very bitter at the time (not that he has changed) but nevertheless he said it and he is on record. General kanene, dont expect KK to say a word on an adult who has self inlicted himself, you are being highly irresponsible to even mention the old man in such breath. Learn from British HC who says his government is appalled at HHs uncivilised manners. Happy birthday KK and please negotiate for HH release and tell him that EDGAR is commander in chief!!!!!!!!!!! Kaunda wampavu,Kaunda wampavu.I want to have the kind of food he eats.No more michopo,no more beer, ok only a few bottles of mosi,no more excitement,no more treasonable behavior. Mushota, you are a sorry excuse for an illeterate ignorant nicompoop! Dr Kaunda and his revered wisdom do not reside in your degenarate orbit! Quit your vainless attempt to dellusional attempts to appear intellectual because you are not, inspite of the distance President Kaunda spotted you and your sorry tribalistic mucus you spew on the constant! Go to that outhouse in your house and wipe the entire length where the sun dont shine and no mirror will lie, and ask yourself, is that me? Dr darkness mushota? Think before you start spitting your hyperbolic lunacy woMan! Dr KK will remain the greatest leader to ever hold office in Zambia.